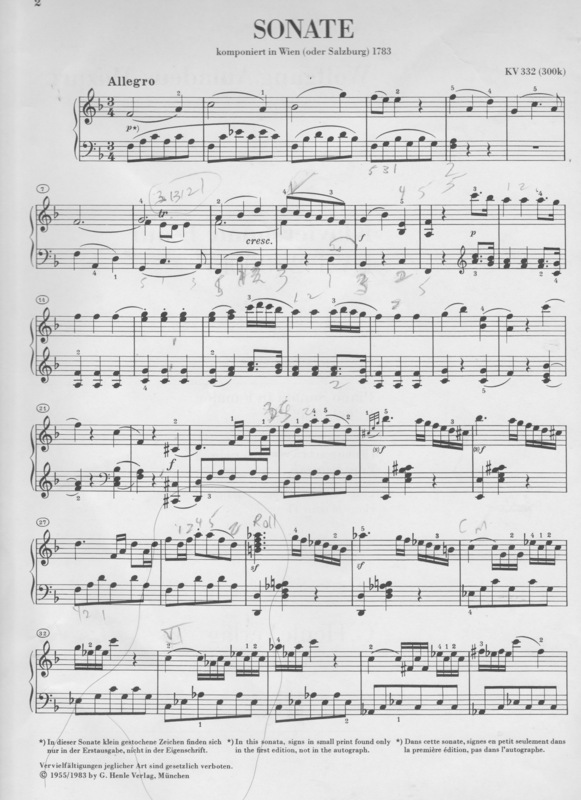 After my review of Wolfgang Amadeus Mozart’s “Drawing Room” Sonata K. 545 in C, Allegro, I discovered by comparison that the opening movement of K. 332 in F Major, had a more complex mosaic. In the short space of its nearly three page exposition, K. 332’s multiple themes weave through markedly contrasting sections. *A Sturm und Drang, or “storm and stress” impassioned set of “minor mode” measures, for instance intersperses more lighthearted “Major” phrases. Perhaps Mozart’s shifts of mood/emotion and dynamics early on in the Exposition, foreshadowed what the composer later expressed with rich development and poignance in his last Symphonies 39, 40 and 41. As a relative newbie to K. 332, I conjecture that my early, baby-step learning process might assist others in their respective musical journeys, so I’ve attached a short tutorial. wish you would talk more about the Secondary Theme and the Development Section. 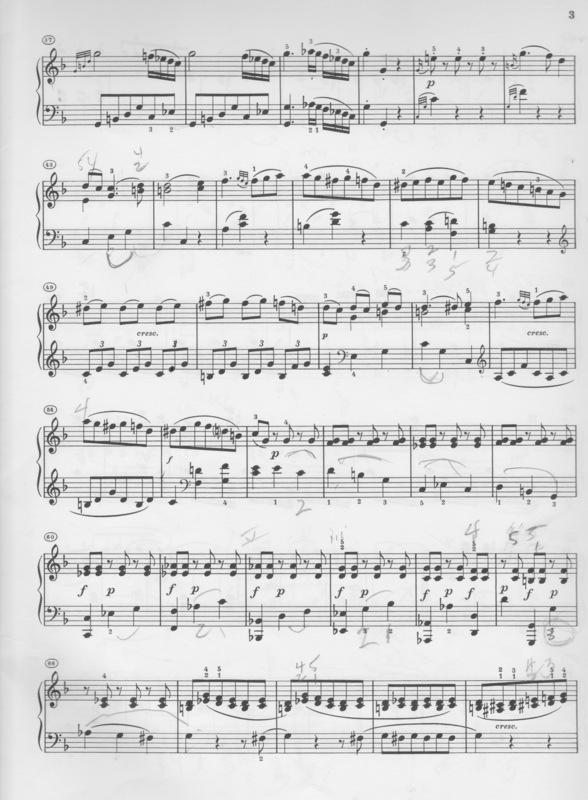 OR major contrasting points throughout the first movement. REALLY ENJOYED your video! I wish you kept going to the Second Movement. I enjoyed your video. Thanks. So much help. Many thanks. Hello, I really enjoyed this video. 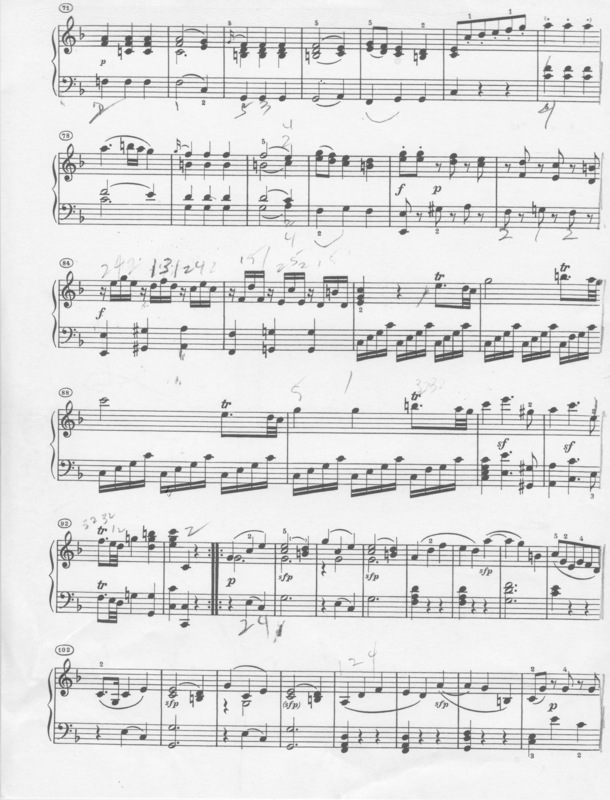 I am working on this sonata at the moment. Do you have any advice on the trills in bars 86, 87 etc to the end of the section. I have tried all variations starting on the note, above the note, 4 notes, 6 notes, turns etc. I loved the way you played them but it’s so fast and I can’t see/hear exactly what is happening. Thanks so much again. Thanks for your note. I believe I have a few tutorials on you tube of those trills.. but I will have to find the time to scope out. Just recovering from a food poisoning episode so I’ve been slowed down. That would be wonderful Shirley – thanks so much. Sorry to hear about the food poisoning – no fun at all. Hello, i really enjoyed your video and explanation. I’m also having the same doubt about the trills that Tracey mentioned in this comment. I looked for tutorials or something like that in the videos you have in your channel and i couldn’t find any video explaining that trills in particular. I found some about the Adagio’s trills. I would appreciate if you have an advice about this. Thank you, very much. Hi, Thanks for your note, I believe I do have a trills video.. and will hunt for one or more, once I clear my lessons, etc. Here’s a video on the trills in Mozart K. 545 not K. 332.. but you can see the concept.. https://youtu.be/B2ATW-RGcwY I will take a look at K. 332 and get back. So yes I now see the trills you are talking about.. these are rapid upper neighbor trills followed by 32note resolutions in the RH, that I will try to make a video about later today. Stay tuned. I will probably add the video to a new blog on trills, adding in the others I have made for various compositions.. Thank you very much for your patience Shirley, i think now i’m starting to playing it right! My Mother had this whole piece practiced to perfection. She never could hear herself play and only heard what she thought were mistakes. While growing up she would practice for hours each morning (in particular) and in the Summer months, as a tweeny, I would just lay in bed and listen to her practice. She was under the wing of Albert Bowen and he was being taught (mentored) by Horowitz. It was a spectacular time in the 1970’s with Classical Piano still being taught to the masses. I appreciate your dissertation above and as I inherited all of her music books, learned something about the storm and stress – which playing this piece – is an understatement!